Metal-Fab Air-Cooled Temp/Guard 8" - 16"
Double-Wall Type "B" Gas Vent for approved category I natural gas or propane-fired appliances, gas furnaces, heaters, fireplaces and boilers in accordance with NFPA 211, standards for chimneys, fireplaces, vents and solid-fuel burning appliances and NFPA 54, the National Fuel Gas Code. 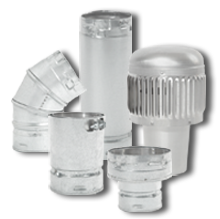 Type-B Gas Vent products are tested and listed to UL 441 for approved gas appliances and feature our innovative twist-lock connection and locking tab, eliminating the need for sheet metal screws. Metal-Fab Type B Gas Vent combines hemmed flues and casings that maximize product durability and reliability and minimize installation time. 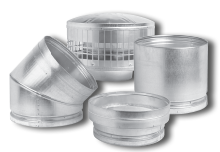 Designed for versatility, Metal-Fab Type-B Gas Vent products 3"-6" adapt to major competing brands and when installed establish a UL Listed connection. For use with category I natural gas-burning or propane fired appliances such as gas boilers, fireplaces, furnaces, unit heaters and radiant tube heaters. 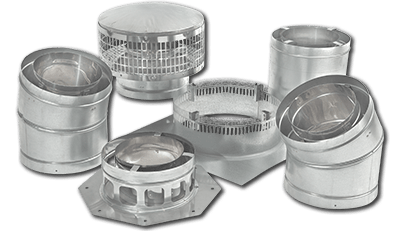 1" Minimum clearance to combustibles for 3" - 24"
2" Minimum clearance to combustibles for 26" - 30"
Type-B Gas Vent products diameters 14″-30″ are tested and listed to UL 441 for approved gas appliances and features our quick connect lock attached with sheet metal screws. 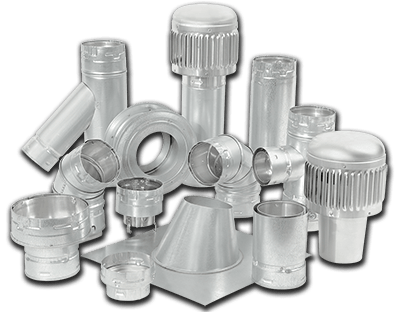 Designed for versatility and efficiency, Metal-Fab Type B Gas Vent combines hemmed flues and casings for precise joint alignment during installation that maximizes product reliability and minimizes installation time.